Tickets are now OFF SALE. Please call the Magical Nights Production Office at (718) 575-1349, or contact admin@magicalnights.com to check for available seats at this performance. T0 PURCHASE TICKETS FOR MONDAY NIGHT MAGIC - 2019 Click Here. 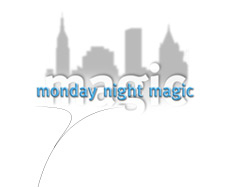 Magical Nights Inc., presents New York's longest running Off-Broadway Magic Show, MONDAY NIGHT MAGIC. Each week you'll find a different array of the finest stage magicians performing world-class magic in an intimate theatrical setting. Monday Night Magic performers have been featured on numerous television shows, including ABC's Good Morning America, CBS's Early Show, NBC's Today Show, America's Got Talent, Penn & Teller: Fool Us, and on The Wall Street Journal Report. * The New York Press gave Monday Night Magic a "Best of Manhattan" award. * TimeOut NY says that Monday Night Magic is, "New York's Best Magic Venue." * The New York Post raved, "It was fascinating - more involving than many big-budget, magic shows I've seen!" 1) Due to the intimacy of this theater and in order to accommodate all patrons, we reserve the right to slightly adjust your location. Any change made will move you to equivalent or better seats than you originally selected. 2) All ticket sales are final and no refunds or exchanges are allowed. This show is not recommended for children under 12, and children under 8 will not be admitted. The Monday Night Magic Box Office open 90 minutes prior to showtime. When you arrive, please tell the Box Office Manager that you are on the Brown Paper Tickets list. Tickets must be picked up no later than 5 minutes prior to the start of the performance as it is the box office policy to release all "held" seats by then. Latecomers will be seated in the rear of the theater and moved forward after intermission subject to seat availability and at the discretion of the box office. Please take note of the date and showtime listed on your confirmation as some evenings we have more than one performance.